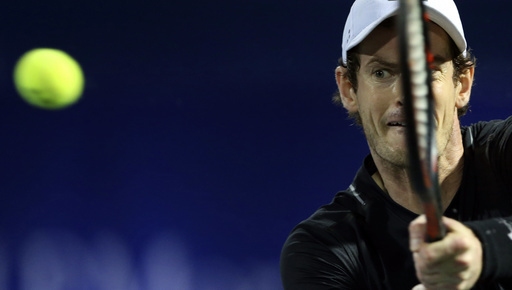 DUBAI, United Arab Emirates (AP) — Andy Murray saved seven match points before beating Philipp Kohlschreiber 6-7 (4), 7-6 (18), 6-1 to reach the Dubai Tennis Championships semifinals on Thursday. The second-set tiebreaker — 31 minutes, 6 seconds long — produced all the high-intensity drama tennis can offer, featuring the seven match points for Kohlschreiber before Murray prevailed on an eighth set point. “I have never played a tiebreak that long ever,” Murray said. “I’ll probably never play another one like that again. The power, angles, and crafty shot-making were so all-consuming in that tiebreaker that the players, as well as umpire Renaud Lichtenstein, neglected to realize there was meant to be a change of ends at 15-15, which took place at 16-16 instead. “There was definitely some unbelievable points in that second-set tiebreak,” Murray said. “We both missed a couple of shots, but in general, I think the level was extremely high. Despite the loss, Kohlschreiber was all smiles after the 2-hour, 55-minute quarterfinal. Kohlschreiber couldn’t keep the momentum going against Murray in the third set, which ended up being one-minute shorter than the second-set tiebreaker. Murray is playing his first tournament since losing in the Australian Open fourth round and overcoming a bout with shingles. He leads Kohlschreiber 5-1 in career meetings. Kohlschreiber, who is 0-10 against No. 1-ranked players, remains one match away from securing his 400th career match victory. Murray will play Lucas Pouille of France in the semifinals. Pouille needed three match points to defeat Russian qualifier Evgeny Donskoy 6-4, 5-7, 7-6 (2). The first two match points came on Donskoy’s serve in the 10th game of the third set. Earlier, former top-10 star Fernando Verdasco upset fourth-seeded Gael Monfils 6-3, 7-5 in the quarterfinals. Verdasco lost all three of his previous matches against Monfils, although it’s been 3 1/2 years since their last encounter. Verdasco served for the match at 5-4 in the second set, but had his serve broken at love. The Spaniard won the next two games to secure a semifinal berth. Verdasco next plays Robin Haase, who defeated Damir Dzumhur of Bosnia and Herzegovina 6-2, 4-6, 6-4.